30 Minute Hawaiian Sloppy Joes - great for crowds, make ahead! These easy Sloppy Joes are smothered in the most delicious sweet and tangy Hawaiian BBQ Sauce your whole family will love and 1000X better than any can! 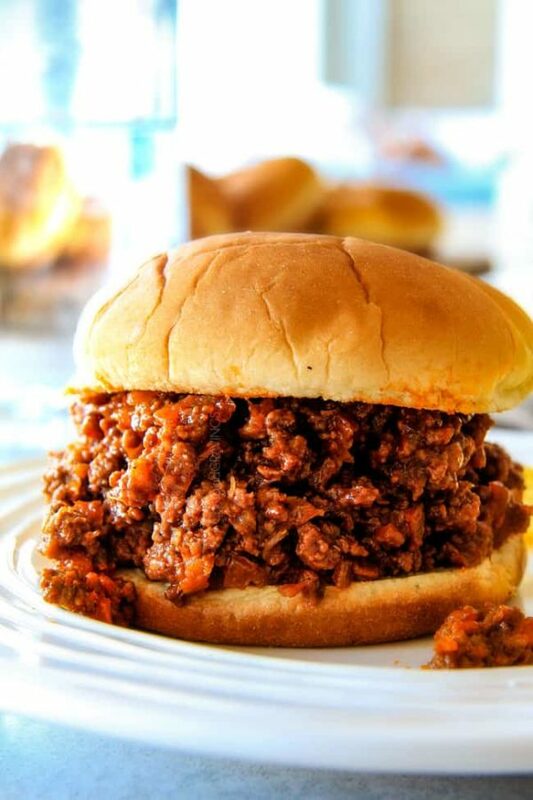 This sloppy Joe recipe is incredibly easy, make ahead, great for crowds and freezer friendly! This Hawaiian Sloppy Joe recipe is not only delicious but one of the easiest and least expensive recipes you can make for a crowd! You can also prep the meat filling ahead of time and either keep warm in the crockpot or simply warm up on the stove when ready to serve. You can also freeze it in advance for instant heat and eat dinners! Eazy peazy! Are you a Sloppy Joe fan? My husband wasn’t a fan until he tried my homemade easy Sloppy Joes, or more accurately, my mom’s homemade Sloppy Joe recipe. I don’t think homemade is always better, but in the case of Sloppy Joes, homemade is 1000x better than any canned variety. Growing up, I always looked forward to my mom’s Sloppy Joes when the cousins came over, or last minute company dropped in or for casual get togethers around the pool. No matter the occasion, the tray boasting the Sloppy Joes was always licked clean. Nothing sloppy every remained with zero leftovers Sloppy Joes. As I mused about my mom’s Sloppy Joes, it dawned on me that they would make the perfect Game Day food – and even more perfect if they were fancied up a bit with homemade (to live for) Hawaiian BBQ Sauce to make Hawaiian Sloppy Joes! So while there are tons of Game Day recipes to choose from (see Favs HERE), these Hawaiian Sloppy Joes are not only some of the most delicious but some of the easiest and least expensive – not to mention you can easily make the meat filling ahead of time and either keep warm in the crockpot or simply warm up on the stove when ready to serve. So what makes these Hawaiian Sloppy Joes so unbelievably delectable? 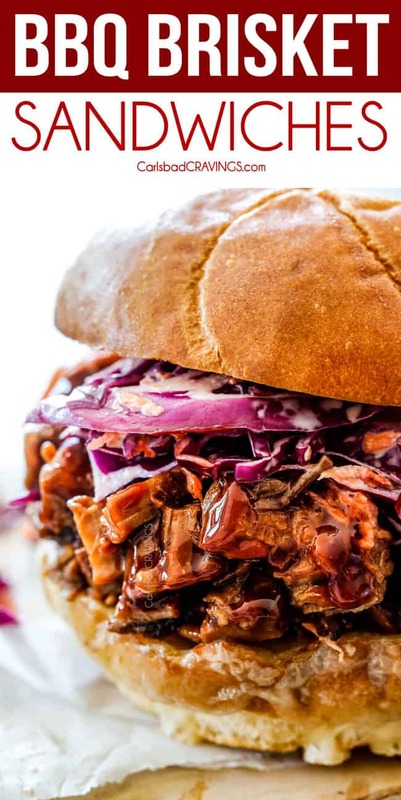 I’ve merged my favorite worlds of my mom’s easy Sloppy Joes’ Sauce, my favorite homemade BBQ Sauce, and crushed pineapple to create otherworldly sweet and tangy Hawaiian BBQ Sauce to smother your tender sloppy beef. I guarantee you will be shoveling this filling into your mouth long before it has time to adorn a bun. 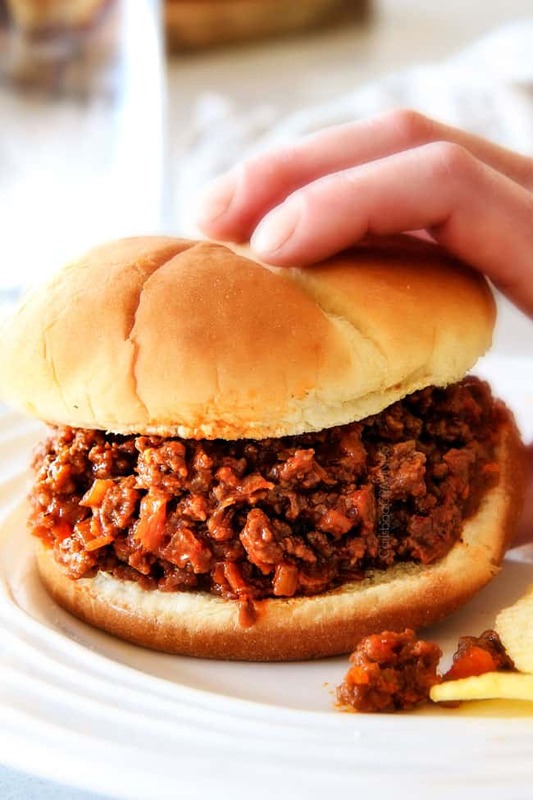 There are a few conflicting stories about where the Sloppy Joe originated, but it is widely believed to have been made by a cook named Joe in Sioux City, Iowa in 1930. Joe added tomato sauce to a loose meat sandwich and the Sloppy Joe was born. What everyone does agree on, however, is that Sloppy Joes are SLOPPY! Just try and eat a Sloppy Joe without any of the fling spilling out! What Ingredients do I need for Easy Sloppy Joe Recipe? Can I Add Green Bell Peppers to Sloppy Joes? Absolutely! Chop your green bell pepper small and add them with the beef and onions. Can I make Sloppy Joes with Ground Turkey? Yes! 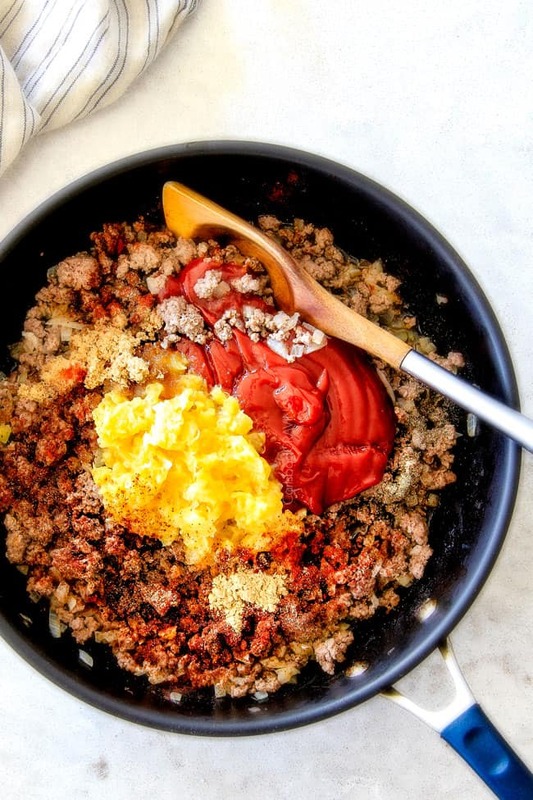 Replace the lean ground beef with lean ground turkey. To help it taste nice and beefy, omit the salt and add 2-3 teaspoons beef bouillon then add salt to taste. This is my secret in all my turkey recipes like my Turkey Chili and Turkey Tacos. Yes! Substitute the ground beef with an equal amount of plant based protein such as crumbled firm tofu, lentils, mushrooms, etc. Classic Sloppy Joes don’t include cheese – but that doesn’t mean you can’t add cheese! You can either spread the bottom of the buns cut side up on a baking sheet, layer with cheese and bake until melted OR place cheese directly on top of the meat piled on the bun while its hot. 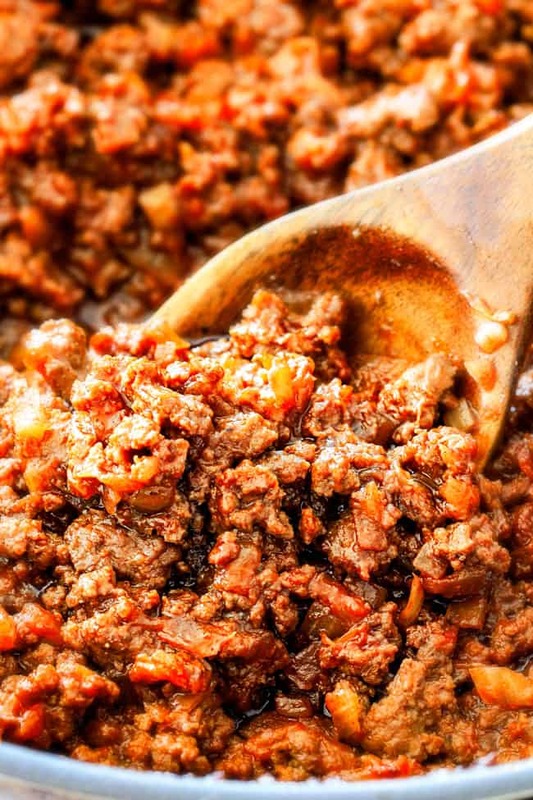 This easy Sloppy Joe recipe comes together in minutes- literally! Step 1: To make this easy saucy filling, brown you beef, onions and garlic then drain of excess grease. Step 2: Next, stir in your pantry friendly Hawaiian BBQ Sauce ingredients of crushed pineapple, ketchup, molasses, brown sugar, soy sauce, mustard, cider vinegar and spices of chili powder, ginger, smoked paprika etc. Step 3: Let the saucy beefy filling simmer together for 15 minutes to let the flavors meld as the the aroma tempts you for the longest 15 minutes of your life. Step 4: Pile the Sloppy Joe filling on Hawaiian rolls or traditional hamburger buns and dig in! 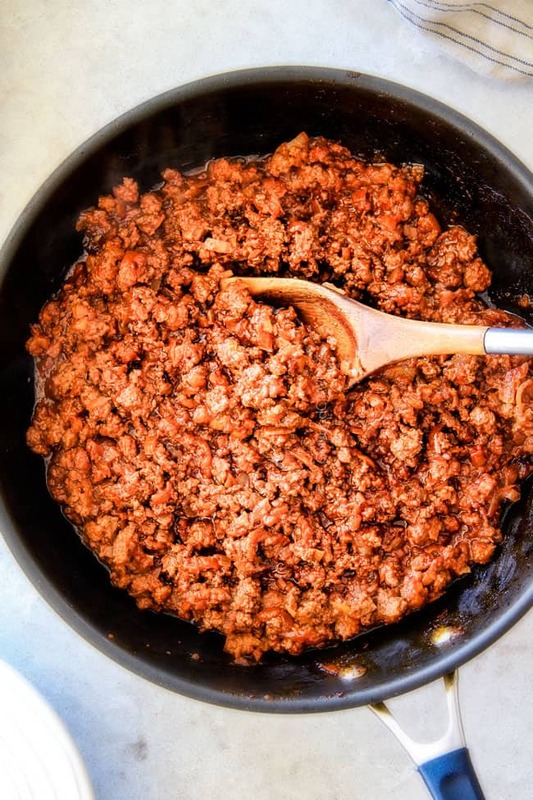 Consistency: When you simmer the Sloppy Joe filling, it should take approximately 15 minutes to reduce BUT it might take more or less time depending on you stove/pot, etc. so watch closely so it doesn’t reduce too much – we want slightly saucy Sloppy Joes and not dry Sloppy Joes. If your mixture is too “wet” after 15 minutes, then continue to simmer to reach desired consistency. For sweeter – add additional brown sugar. For more savory – add less brown sugar or add hot sauce to balance the sweet. For tangier – add additional apple cider vinegar or yellow mustard. For saltier – add additional soy sauce. For spicier – add hot sauce to taste or cayenne or chipotle chili powder. Other fixings: You can keep your Sloppy Joes plain and traditional or add anything your heart – or belly – dream up such as bacon, cheese, pickles, jalapenos, pepperoncinis, Fritos, potato chips, etc.. Yes, you can certainly make Sloppy Joes in the crockpot, but I prefer just warming the meat filling in the crockpot because Crockpot Sloppy Joes tend to have a softer texture and you still have to brown the meat on the stove first any way. To make Crockpot Sloppy Joes, follow step 1 in the instructions in which you brown the beef and onions, then add the garlic and drain off excess fat. At this point, you can transfer the beef to the crockpot followed by all the remaining Hawaiian BBQ Sauce ingredients. Give everything a good stir to combine and cook on LOW for 4-6 hours. I recommend removing the lid the last 30 minutes or so some of the moisture can evaporate. 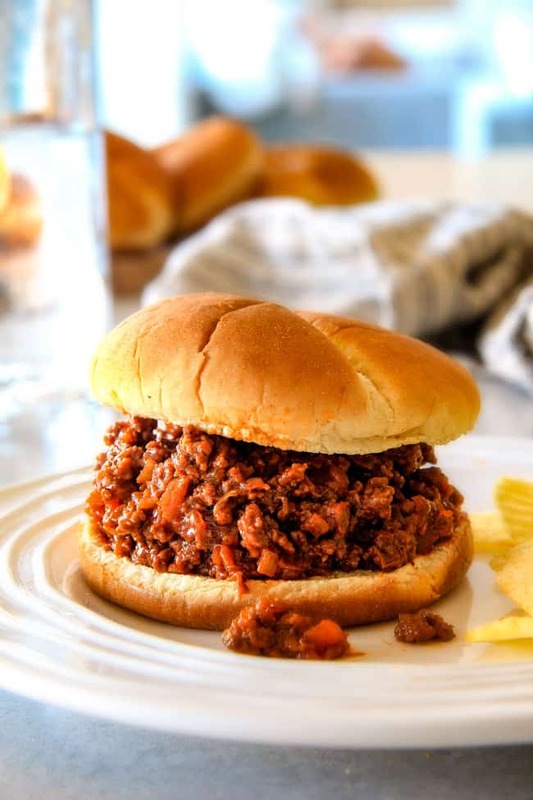 The Sloppy Joe filling can be added to the slow cooker after it has simmered to stay warm for Game time/party time/crowd time or simply ready for dinner/family time with just the lifting of the lid. That is my type of Hawaiian paradise. What Buns are Best For Sloppy Joes? For these Hawaiian Sloppy Joes, I recommend Hawaiian Sweet Rolls. You can also use traditional hamburger buns, pretzel buns, brioche buns and if you’ve forgotten the buns, serve extra sloppy sandwiched in between white bread! OR heat about a tablespoon of vegetable oil in a large nonstick skillet over medium high heat. Once hot, add buns, cut side down and cook until toasted, about 2-3 minutes. What Sides Should I serve with Sloppy Joes? How Do You Store Sloppy Joes? Store Sloppy Joe filling separate from the buns in an airtight container in the refrigerator for up to 5 days. Can You Freeze Sloppy Joes? Let filling cool to room temperature (you can place in the refrigerator to speed up the process). Add filling to either a freezer size bag for a large quantity or to smaller sandwich bags for individual portion sizes. Freeze Sloppy Joe meat for up to 3 months. When ready to eat, let meat thaw overnight in the refrigerator and then remove from plastic bag to a bowl to microwave (for smaller portions) or to a skillet to to reheat over the stove. WHAT CAN You DO WITH SLOPPY JOE MEAT? Want to try this Sloppy Joes Recipe? 30 Minute Hawaiian Sloppy Joes smothered in the most delicious sweet and tangy Hawaiian BBQ Sauce your whole family will love! Incredibly easy, make ahead and great for crowds! You can also prep the meat filling ahead of time and either keep warm in the crockpot or simply warm up on the stove when ready to serve. Brown hamburger and onions together in a large skillet over medium heat, breaking up any clumps. Add garlic and cook 30 additional seconds. Drain any excess fat. Add all remaining Hawaiian BBQ Sauce ingredients and stir to combine. Bring to a simmer then reduce heat to low. Simmer, uncovered, for 15 minutes, stirring occasionally. Taste and add additional cider vinegar for tangier or more brown sugar for sweeter if desired. Serve on Hawaiian sandwich buns or traditional hamburger buns. Enjoy! Hi Laurel! I love your idea of cramming veggies into Sloppy Joes – brilliant! I hope your entire family loves this new flavor spin! Your Sloppy Joes sound wonderful! And I love Laurel’s idea of the veggies. I’ve yet to see a little person who didn’t like Sloppy Joes and then the boost of veggies is terrific. I bet the addition of the pineapple really make them scrumptious! Have a great weekend. Can’t wait to make these sloppy joes for my boys. Mouthwatering! Thank you Cara! I hope you all love them! Looks like another keeper…..I hope to remember to give a little review after making these (and others of yours!). I don’t know how much work it takes to do all your postings with pics,, …….so, thanks…and even though some of us don’t comment, YOU are appreciated!! What a thoughtful comment Allie, than you so so much! I followed food blogs forever before my own and never commented and now I know how nice it is to get comments – they are always so appreciated! So thank you for this one and thank you in advance :)! Made it tonight! We loved it. I did swap out pork for beef. Awesome Allison! I love that you made it already and am so happy it was a hit, thank you for taking the time to comment! I made these for my somewhat picky family tonight and they were a huge hit!!! Seems like a lot of ingredients but that’s what makes it so delicious! Thank you for a wonderful recipe that my entire family loves!! Awesome Jessa! I am so happy to hear these Sloppy Joes were a winner with your entire family! Thank you so much for taking the time to comment! Hi Carolyn, I am thrilled you loved these Sloppy Joes so much and that they are now a new regular in your house! Thank you!!! Made these last evening and they were DELICIOUS!! Thank you for a recipe that will definitely show up in a regular rotation! I halved the recipe…. other than that, I didn’t change one thing. Thank you! You are so welcome Marcia! Thank YOU for taking the time to comment! I am happy to hear you loved them enough to make them a new regular! YAY! I’m so happy you love these so much they’ve replaced your old recipe and have been hit with everyone! And you are so right, one of the easiest meals for a crowd! Thank you Therese! I cook this one and eat it for lunches during the week. This is fantastic!!! Haven’t found a recipe I don’t enjoy of yours. My go to page! I stopped cooking for a long time, due to ptsd. I found one of your recipes on facebook and it made me want to return to my kitchen. It helps that all my spices are the ones you use and I buy often. Thank you again! Thank you for all your comments Jessi, I love hearing from you and it’s fun to see which recipes you’ve tried! I am so honored my page is your go-to and that it has helped you get back into the kitchen. That seriously means so so much to me! I hope you continue to find many new favorites! I came across your website at work and now I can’t wait to get off and try this recipe over the weekend! Welcome to my site Rusty! I hope you absolutely love these Hawaiian Sloppy Joes and have fun exploring the rest of my recipes! Your recipe calls for yellow mustard, is this the prepared yellow mustard or ground mustard? 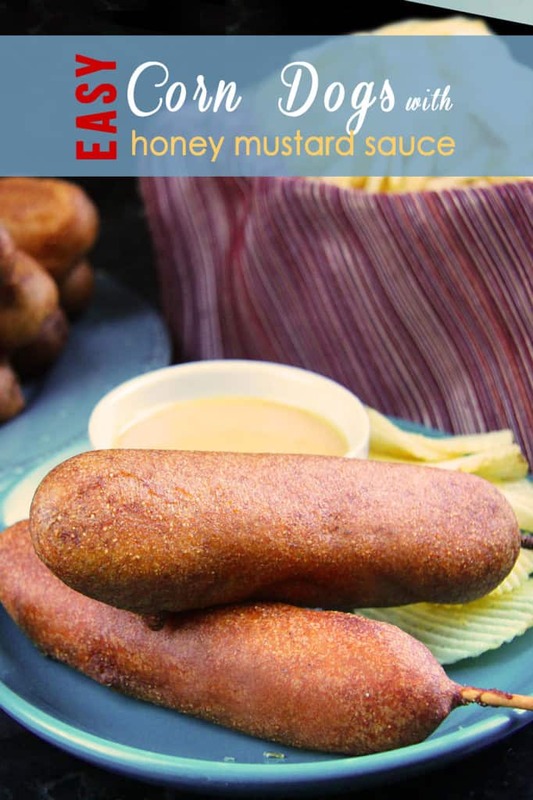 This is the prepared yellow deli mustard – enjoy!